Eternal Love Gothic Violet Purple Crucifix & Roses Mini Dress Tutu [5132V/R] - $37.40 : Mystic Crypt, the most unique, hard to find items at ghoulishly great prices! 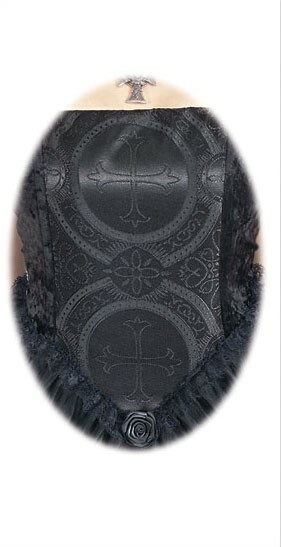 Crusade the party in our "enfant terrible tutu" of Ecclesiastical Crucifix Brocade !! The rest of the boned top is black, stretch panne velvet with adjustable shoulder straps. Black tulle skirt lined with crisp black taffeta, trimmed with roses. Polyester/Acetate. Dry Clean Please read measurements carefully! Very Short, Read measurements.